The Pens got their crucial first win Monday afternoon, and better yet got it done against the Devils. The Pens quickly broke the curse of being unable to beat NJ, and went into Prudential Center to dominate. It was such a major turnaround from last year that in this game alone the Pens 3 goals have already matched 60% of their entire total from last year vs the Devils. The Devils' style of play was noticeably different from last year, with not nearly as strong of a trap defense and more open ice movement. The Pens had little trouble gaining the zone and putting quality shots on Brodeur, and although Marty was pretty solid, a few did find their way past. Alex Goligoski tallied the 1st with a rocket slapshot on a play set up by a great play from Eric Tangradi on Kovalchuk. 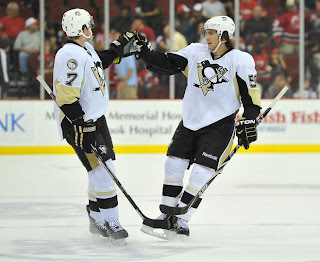 The Pens' 2nd goal was tallied by Mark Letestu after he deflected a Kris Letang slapshot behind Brodeur with his skate. Paul Martin got the third empty net goal, and got himself the last laugh on a crowd that was showering him with boos every time he touched the puck. As I said before, Marty was good but the real hero was the man between the pipes across the ice from him. Brent Johnson, making his first start of the season, posted 30 saves and held off an onslaught of Devils' shots in the last 10 minutes to preserve the win for the Pens. After the game, he mentioned how he relishes "every opportunity to start" that comes his way and how happy he was to be able to tally such a pivotal victory for the team. The Pens did experience a scary moment when Zybenek Michalek left the ice holding his arm. This could amount to some serious difficulty for the Pens D, who was already playing the game without shutdown man Brooks Orpik. With time running out, Travis Zajac deked out most of the Pens' defense along with Johnson and seemed poised to tuck in the equalizer when Craig Adams came out of nowhere to poke the puck away and prevent the Devils from tying up the game. Offense- B+ Looked much better and was able to get quality shots on Brodeur throughout the game. And they were even rewarded with the occasional goal. Defense- B+ Held their own without Orpik and Michalek and overcame a short bench (though not as short as the Devils) to contain Kovalchuk and Parise and keep the Devils from most of the high percentage areas. Johnson- A How can you not give him an A. He made some crucial saves down the stretch and would have had a shutout had it not been for a rocket shot by Elias. Great performance by Brent. Powerplay- C+ Ok so they got a goal but at least 4 of their 6 powerplays looked uneventful and sluggish not to mention that they were unable to convert on a 5 v 3. Still work to do on the PP. Penalty Kill- A- Weren't really needed much but they got the job done when they had to so they get in the A range. -3 games, 3 solid performances from Tangradi and Letestu. If they keep playing like this, there is no way that either of them get sent down even when Asham and Staal return. -Though many of the Pens posted strong individual performances, I must say that I still don't care for the new lines. Comrie wasn't nearly as effective with Sid as he was with Geno and Dupuis was a non-factor on the 4th line. It is hard to eval the new D pairings because of Michalek's early exit. -Sid looked like he drank about 4 red bulls before he took the ice. He seemed like he was everywhere, making acrobatic shots and passes as well as backchecking hard. He still hasn't scored yet, but he looked a lot more like the Sid we all know and love.